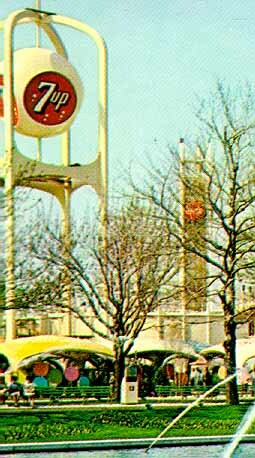 The Seven-Up pavilion featured a futuristic 107 feet high tower with a clock on top. Its international sandwich garden served up, buffet style, the food specialties of 16 countries in elaborate sandwiches, plus all the 7-Up that a customer could drink. Sample sandwiches; sliced lamb on Scotch barley bread, Lomi-Lomi salmon on Aloha coconut bread, prosciutto and provolone on sesame bread, chicken-ginger-coconut on cinnamon swirl bread. Four sandwich platters with relishes, cheeses and candy cost $1.55. A five-piece ensemble entertained daily. They played American show tunes as well as music from all over Europe and Latin America.